Don't miss the April 26-27 “Wine 4 Paws” weekend in San Luis Obispo County's beautiful wine region benefiting the animals at Woods Humane Society. 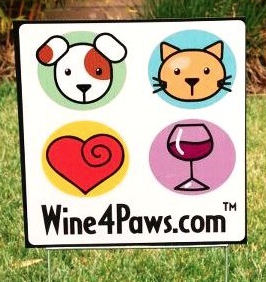 Pet-loving wine drinkers can help support Woods Humane by visiting any of the participating wineries during the event. You won't want Bella and Duke to miss out on the fun, so we've put together an itinerary of wineries that allow leashed, friendly, sociable dogs on their property. More than 50 of them are participating in this event! All will let Daisy dally on the patio and or picnic area, and most even let your pooch in the tasting room. However, please be sure to check with each winery for their full policy. Print your free map/passport here. Get it stamped when you help generate a donation, and you’ll be entered in a huge raffle. With more than 55 years of animal rescue under its collar, Woods Humane Society is one of San Luis Obispo County’s favorite local nonprofits. Here dogs and cats waiting for their forever families find respite under the loving care of dedicated staff and volunteers. State-of-the-art facilities include spacious dog kennels, spay and neutering, and three off-leash dog areas. All pets adopted from Woods are spayed or neutered, micro-chipped, vaccinated and given a free vet check. With a 95 percent adoption rate, one of the highest in the nation, Woods is certainly something to bark about.